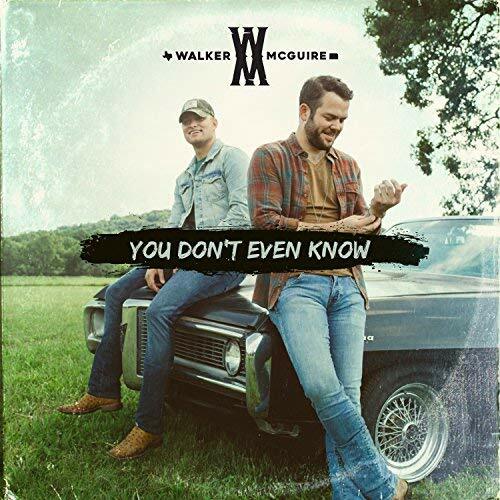 If you haven’t yet heard of the duo Walker McGuire, you’re in for a real treat! Ball cap wearing Jordan Walker is a native of Vernon, Texas and Johnny McGuire’s roots are a bit further away in Fairway, Kansas. McGuire mentions in their bio: “Our sound ranges from those old-school ballads to really up-tempo, in-your-face pop-country rock.” And Walker adds: “We tell people, if you took Keith Whitley and Tom Petty and intersected them at Matchbox 20, that’s kind of what we’re going for.” With a unique style, Walker McGuire is making their mark on the ever-competitive country music scene. The Nashville based twosome was formed six years ago. Their well-received, five track, self-titled EP was released back in January 2018. Fans were asking for new music, so Walker McGuire decided to release one new song on the second Friday of each month. Putting all unluckiness aside, the first song in this series, titled ‘You Don’t Even Know,’ dropped on Friday July 13th. After some nights on the town, you wake up and think ‘I just want to forget that night ever happened‘ and after other nights you wake up and think ‘what on earth really just happened?‘ ‘You Don’t Even Know’ depicts a “what on earth really just happened” night and the aftermath of not being able to remember certain details! It’s a rocking country song with dynamic guitar riffs and a strong percussion beat. Describing a crazy night of partying, the pair sings: I was on top of the bar doin’ shots. Stole the mic from the band. Said can I get again hell yeah. Realizing that they can’t remember exactly how the night went down, they sings: Just checked my bank account, Hell I ‘bout fell out. Man, how am I gonna pay my rent. Must have bought the town rounds. Yeah, we were throwin’ down. May seem crazy but I’d do it again. It’s a fun-loving song that will definitely get a crowd up on their feet. Hopefully you were able to see Walker McGuire in Foxborough, MA at Toby Keith’s I Love This Bar and Grill back in August. They’ll be back in New England on November 8th at the Palace Theatre in Stamford, CT. Favorite Lyrics: Cause the party was cruizin’, Got the pictures to prove it. But there’s only so much fun this phone will show. Naw, you don’t even know. You can purchase ‘You Don’t Even Know’ on iTunes here. This entry was posted in Home page blog, Reviews and tagged Johnny McGuire, Jordan Walker, Walker Mcguire on September 29, 2018 by BeckyNECM.